I haven’t been to the dentist in years; what should I expect? How can veneers improve my smile? Does chronic stress impact periodontal health? Time flies when we are not at the dentist! Before you know it, years may have gone by. Let’s take a moment to explain what takes place when a patient comes back to receive care after an extended period of time. After a while, small dental concerns or issues can grow into an unexpected journey of discovery and expense. Anxiety is common and expected. Let’s discover first of all, “What brings you here today?” It is a good place to start and once the initial concerns are addressed, a comprehensive plan to restore optimum dental health can be arranged. During the first appointment Dr. Rick Johns and our team want you to feel comfortable, and establish a confidence allowing you to be open with any questions. Your visit will take approximately 90 minutes. First, a complete medical and dental history will be recorded and reviewed in one-on-one interview style. This is the time to voice any concern, anxiety issues, worries, etc. Then, X-rays are taken to provide additional information about what is happening beneath the surface of your teeth and gums. Finally, a series of screenings including those for oral cancer, home care evaluation, and periodontal disease are conducted to complete your oral health evaluation. The hygienist has a great eye for other conditions such as broken fillings, cracked teeth, active decay, and other dental concerns. Then, Dr. Rick Johns will come in for a comprehensive exam and list and prioritize your dental needs. Our treatment coordinator will present scheduling options, insurance coverage, and payment plans. Our team will coach you and help you gain control of your own dental destiny with good home care habits. You will receive a bag with a toothbrush, floss, appropriate toothpaste, and any other specialized tools for your needs. 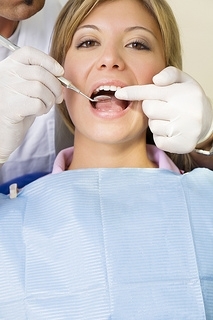 You will know how often you need to return for hygiene visits or other dental appointments. Our patients at Rick Johns Dental are our most important asset, and we strive to create a comfortable experience, no matter how long it has been since your last visit at our Highland, IN office. From phone conversations to financial arrangements to clinical treatment, we want you to feel confident that our team will meet your needs.